Lots of hard work went into this one, and I'm super proud of the results. 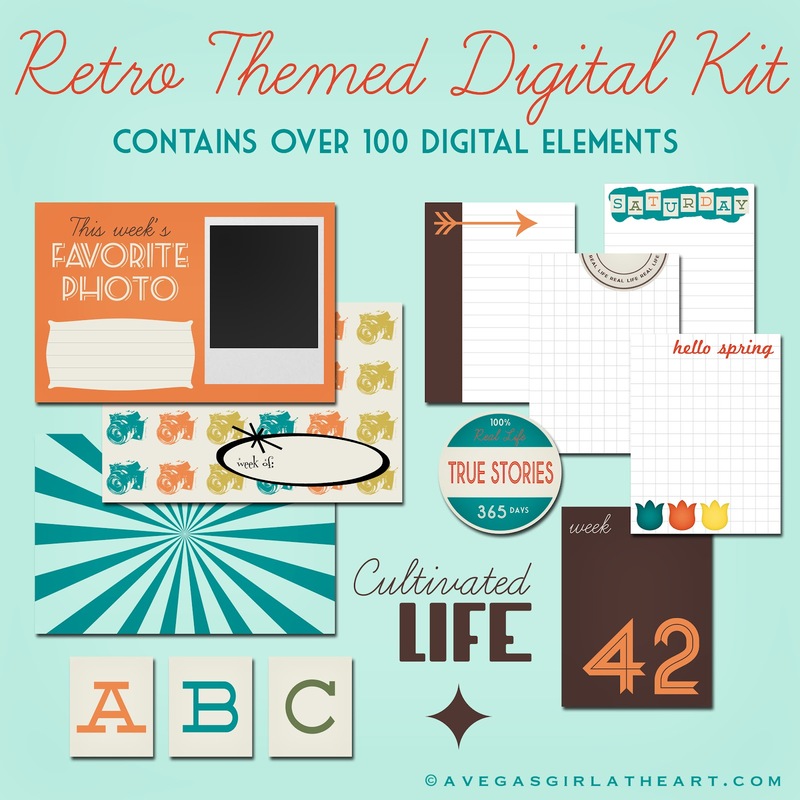 This is a digital kit to use in your Project Life albums. This kit is packed with retro themed goodies, and here they all are. The download links are below each image. (This is due to size - it's much quicker to give you multiple links than one huge download - and this way you can choose which elements you like). Click any image to zoom in and check them out. 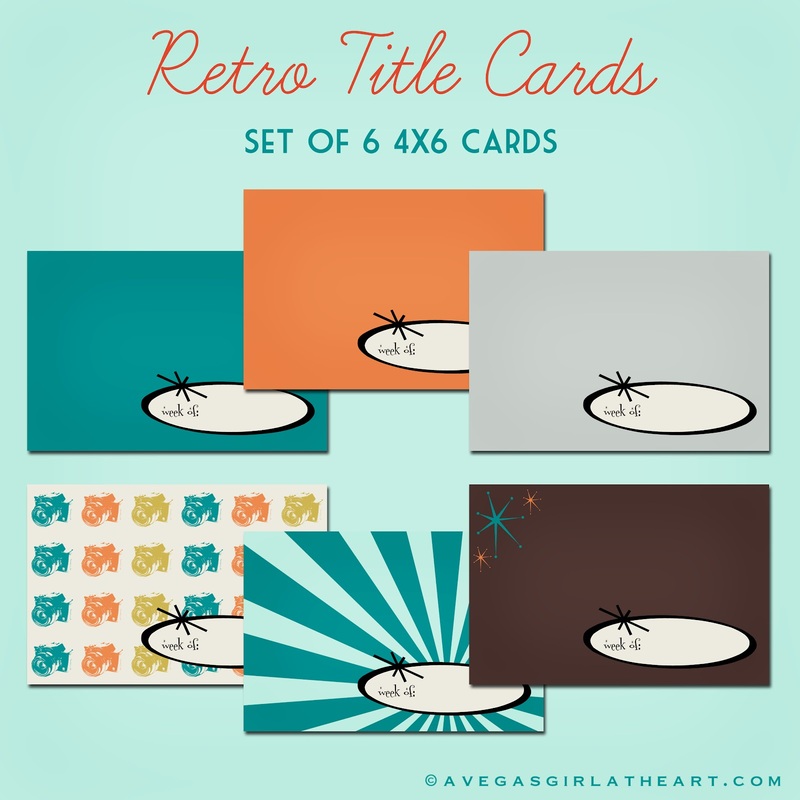 Another batch of title cards - these ones have a spot for a favorite photo, and space for journaling. 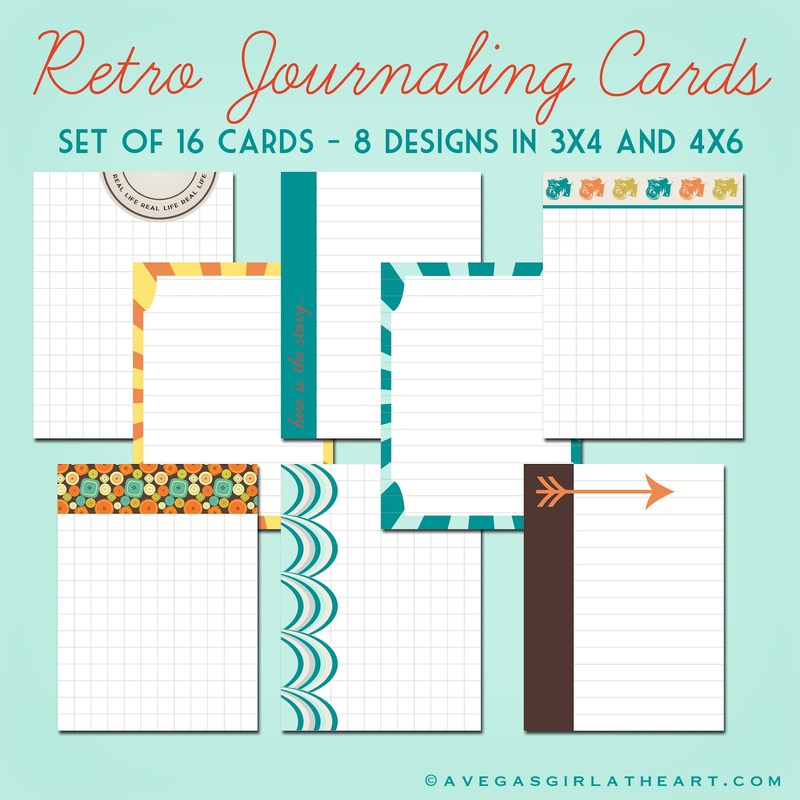 You can print it out and stick your photo on top, or use the layered template to drag your photo in and type in your journaling before printing. Next, the place where we record our memories, the journaling cards. 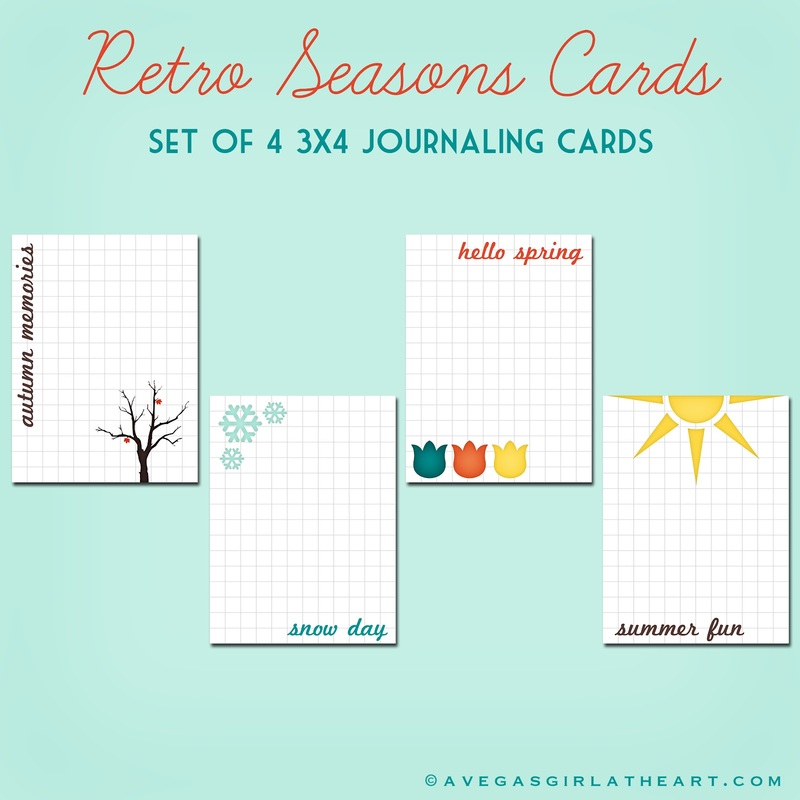 There's a patterned set for everyday use, a set of days of the week cards, and another set themed for the seasons. I've got some fun filler cards for you guys too, that match the title and journaling cards. 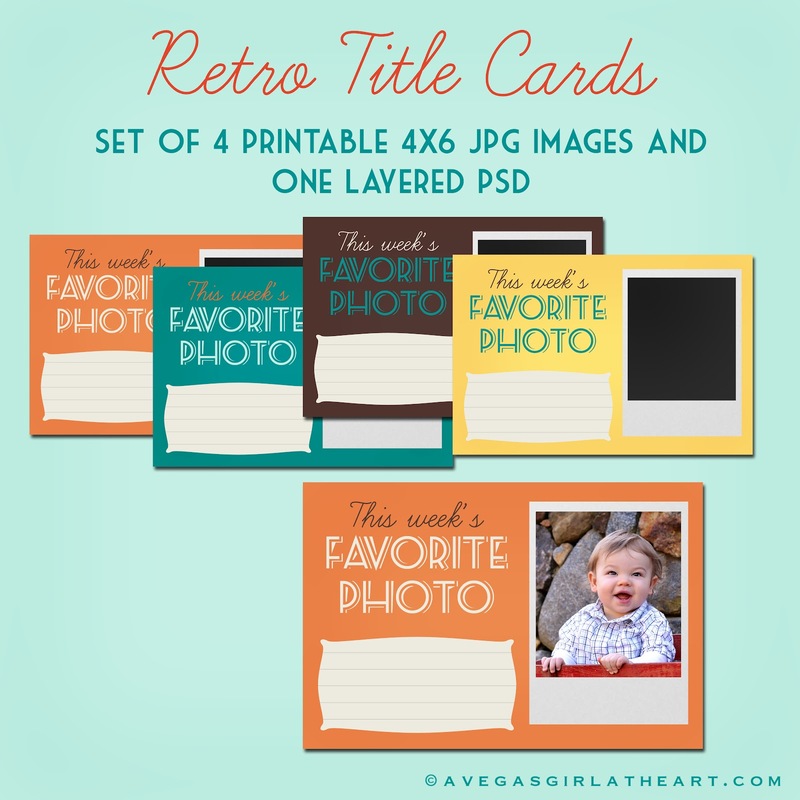 Print them out and use them as is, or layer your photos and embellishments on top. And how about these week number fillers? With space for small photos or embellishments too. 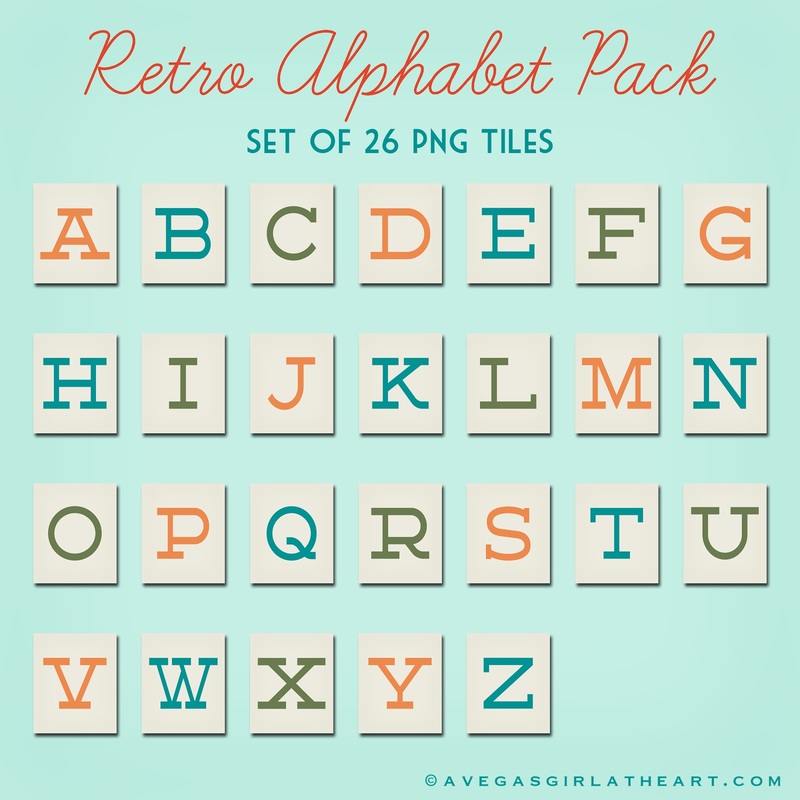 There's a cool retro alphabet tile pack with this freebie. These would be great in the corner of a journaling card or photo as a monogram. 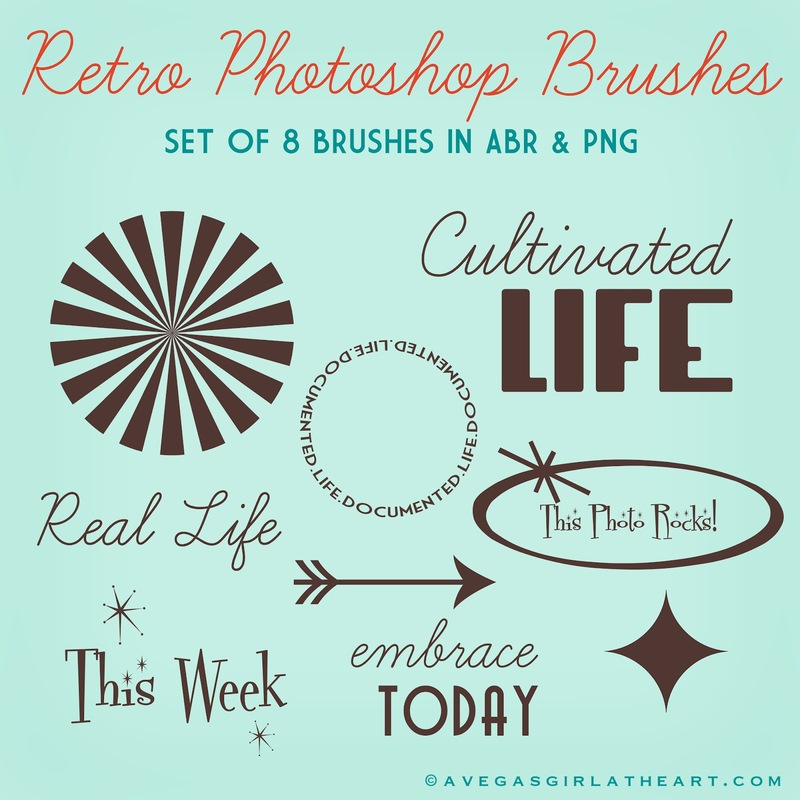 Of course, what would one of my freebies be without a set of Photoshop brushes? (They're also in PNG format for those of you without Photoshop or PSE - check out my tutorial here). Whew! I'm sure now you can see why I'm just a little bit behind in my own Project Life. :)This has taken up all of my nights for the past several weeks, and I am sure relieved to have it done. If all of these freebies aren't enough for you, I've also listed a bunch of coordinating items for sale in my Etsy shop. 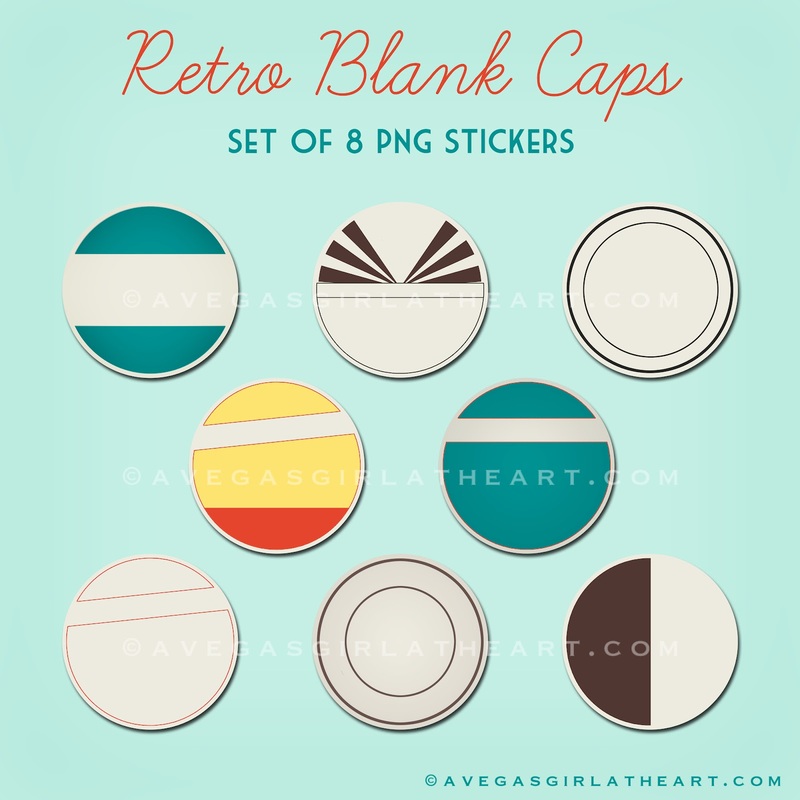 The plan is to expand on this line in the future with more retro items. 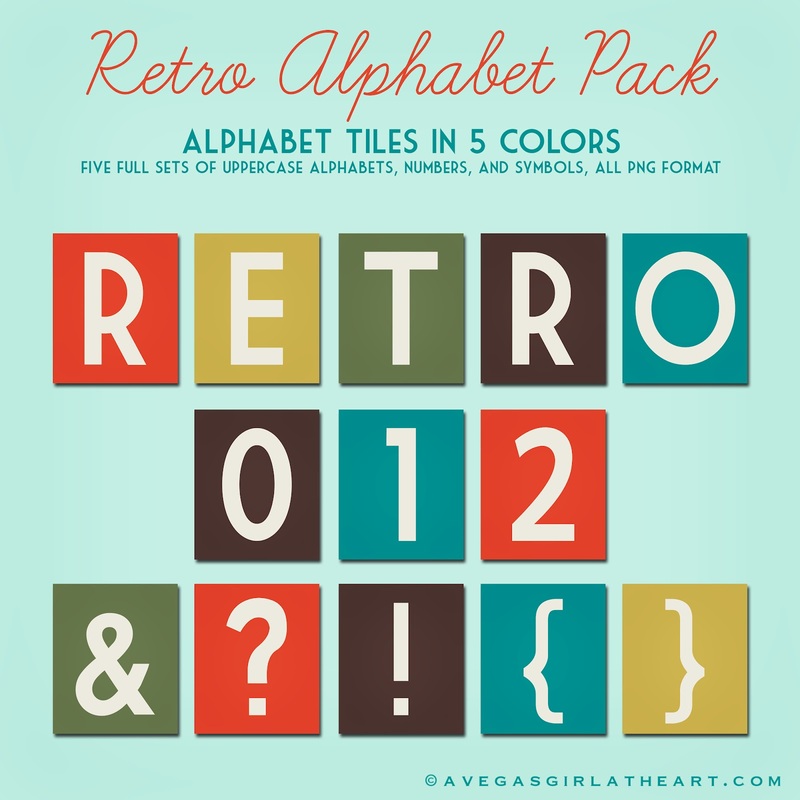 There's a huge alphabet tile pack, which includes a full set of each letter plus numbers and symbols, in five different colors. 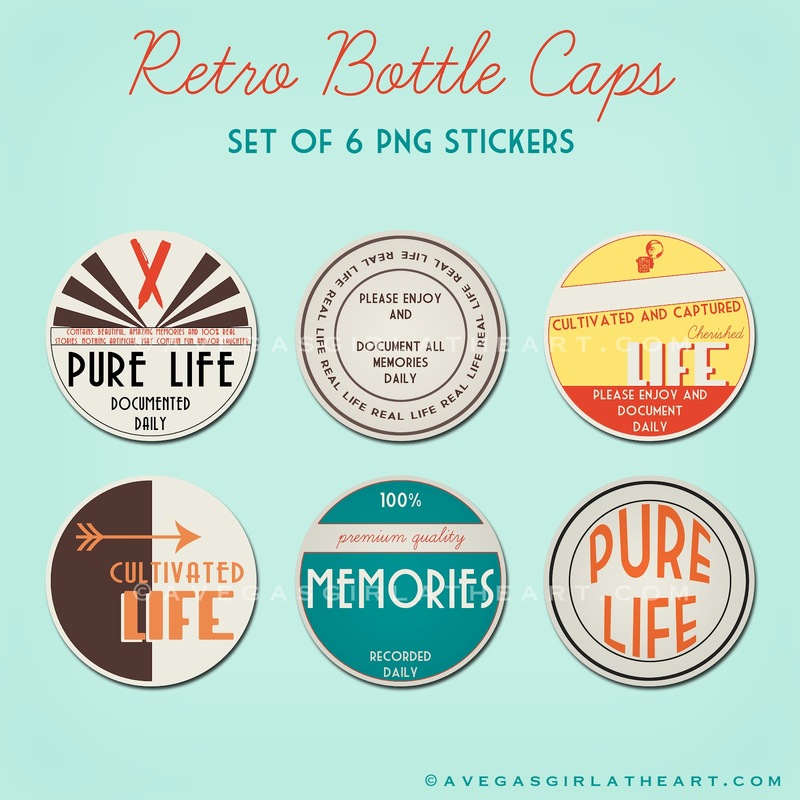 I loved those milk bottle caps, so I made up another set of them here that are a bit more elaborate, along with a set of blank ones that you could add your own text and graphics to, or print out and embellish with stamps or your handwriting. I especially love the yellow & orange one! 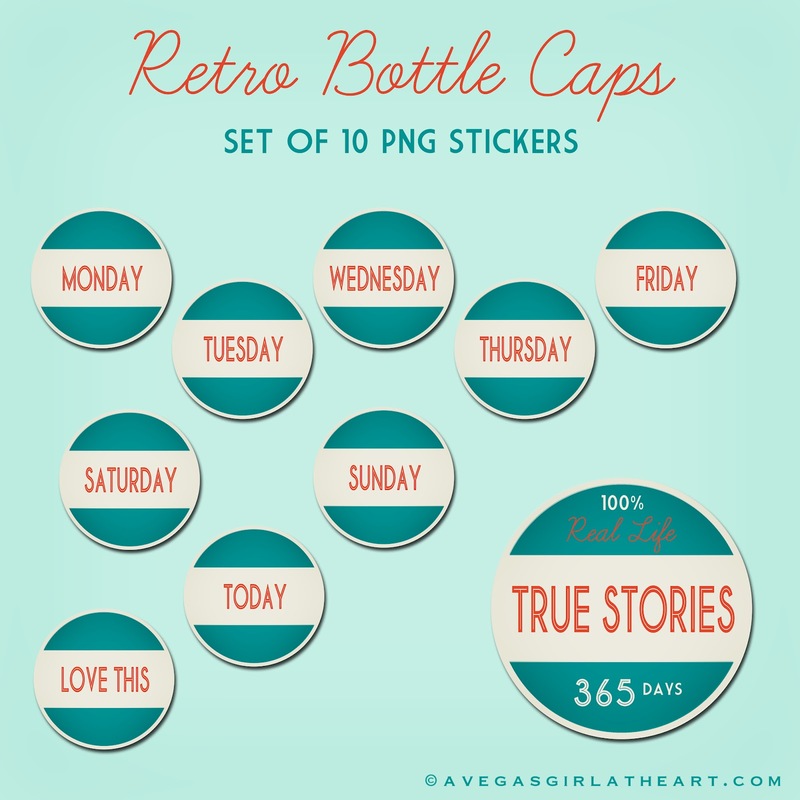 And some simple days of the week buttons. (They're the same color as my background, so I had to add a strip of gray to my image below so they'd pop for you, instead of just looking transparent. A little oops on my part, as I didn't think about my background before doing the buttons, but I love the color so I stuck with it). 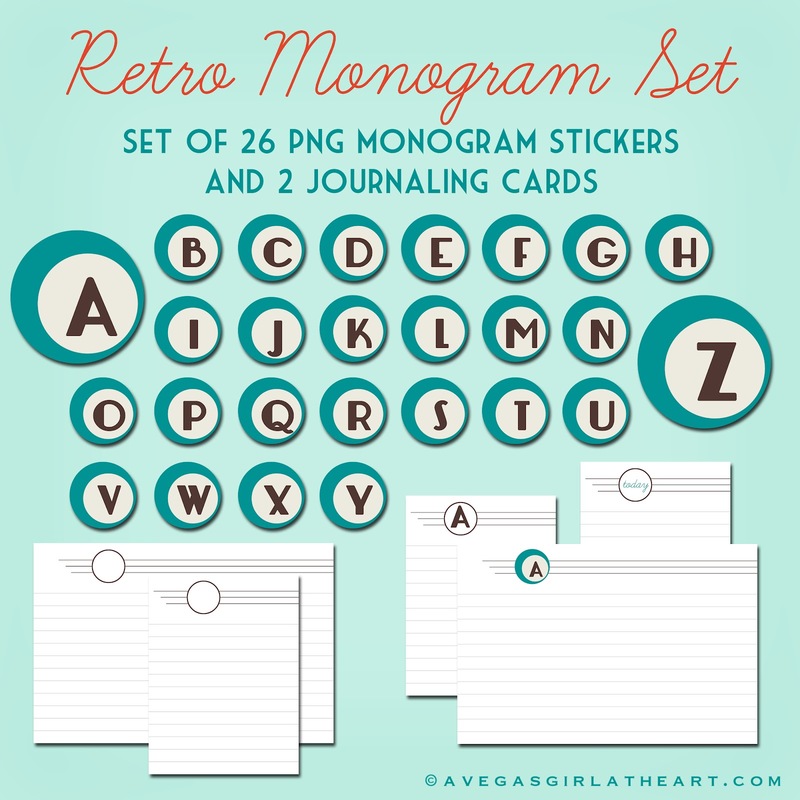 I also made this awesome set of retro monogram stickers (and journaling cards you can use with them). You can drag on one of the stickers and resize it to fit the circle on the card, or you can add your own text to that area. 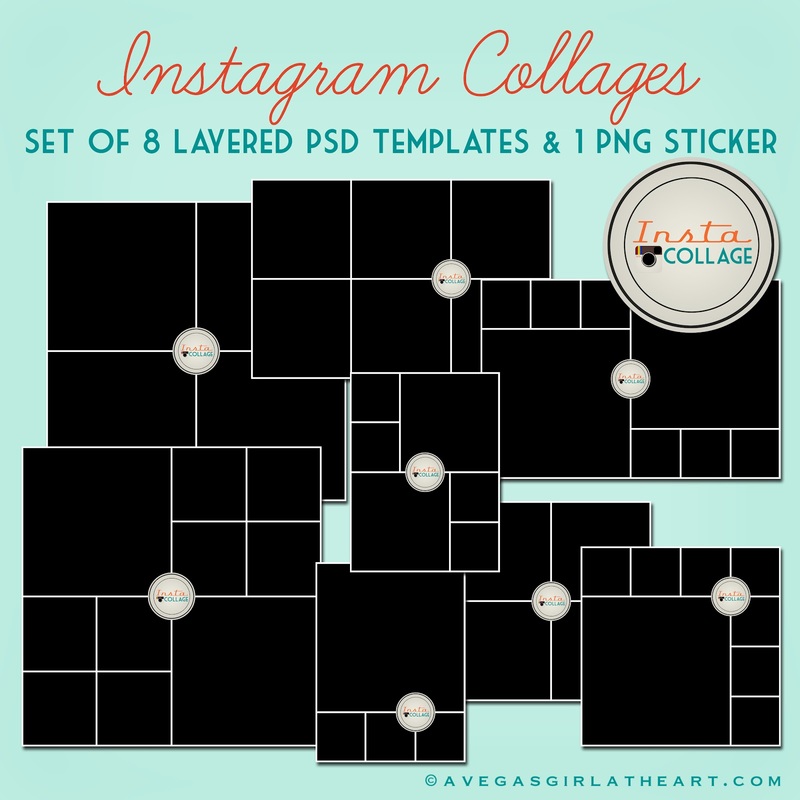 Finally, I've got a set of layered Instagram collage templates. 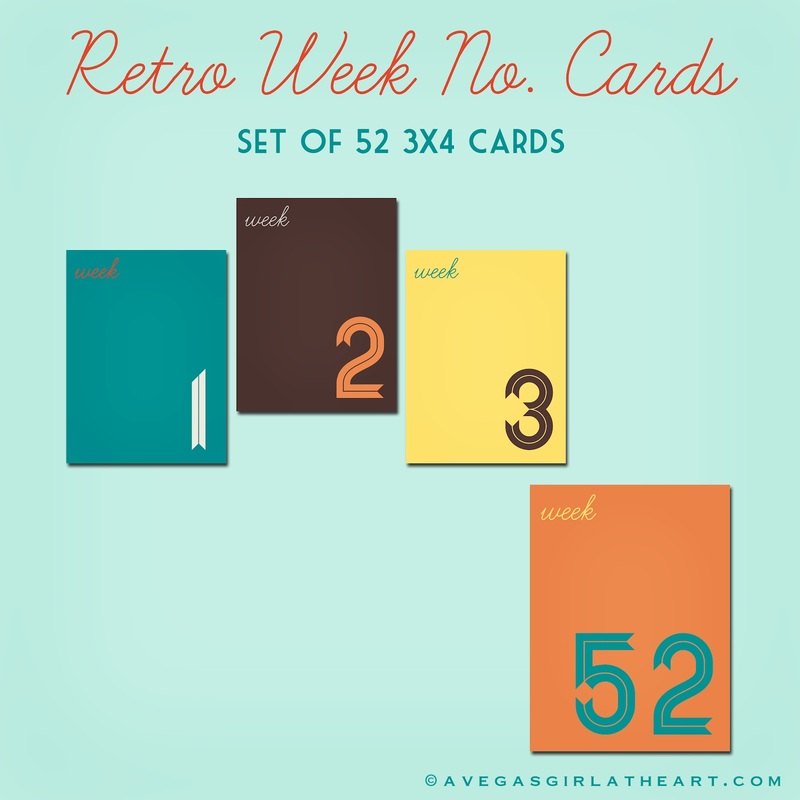 There are 8 templates - 2 for each size: 4x6, 3x4, 4x4, and 6x6. Photo sizes range from 1" to 3". A fun way to add a few extra Instagram pics into your layouts. These are layered PSD files. 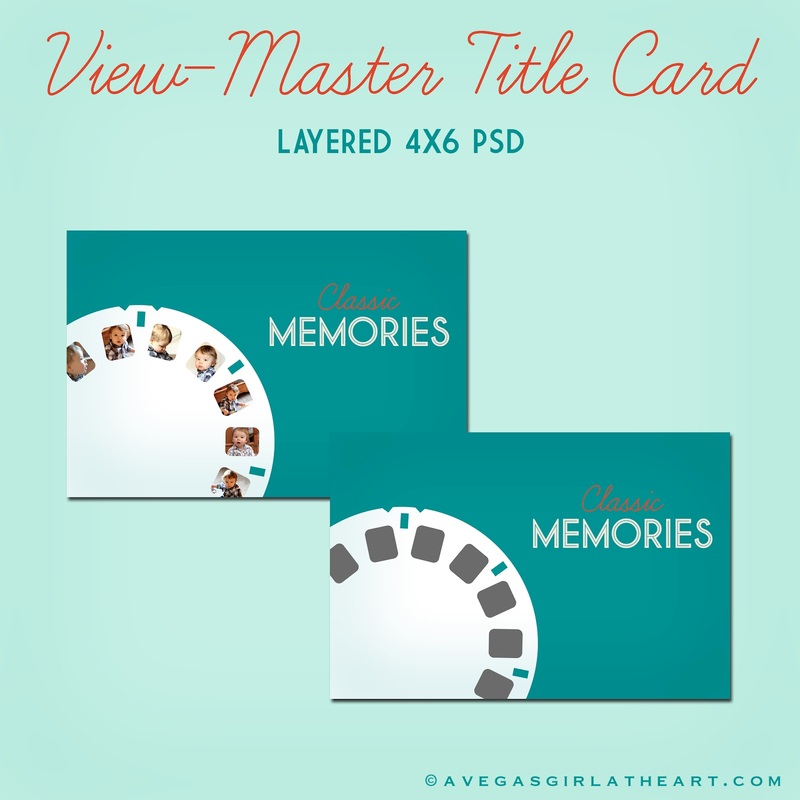 Each has an "Insta Collage" button layer included in the template, which you can turn off. And the pack includes the button on it's own so you could use it for other things. Don't think these only go with the retro kit. Turn off that button layer and it's a simple template that you can use in your current Project Life albums. I wish I had time to pull together an example Project Life layout to show all of you, but I just didn't get there. I plan to post a layout in the next few weeks using these, so you can really get a feel for how they look. In the meantime, if any of you use my designs, I'd LOVE to feature your layout on this blog. Shoot me an email at melissa@avegasgirlatheart.com with your photos and a little information, and I'll post it here. Now, in honor of this big release, I've put all digital products in my Etsy shop on sale for one week only! This sale runs today, August 17, 2012, through 11:59PM EST on August 24, 2012. Every digital item I have is on sale for 50% off, including today's new products. These prices will return to normal next week - so if you love these new items, make sure you grab them while they're on major sale! 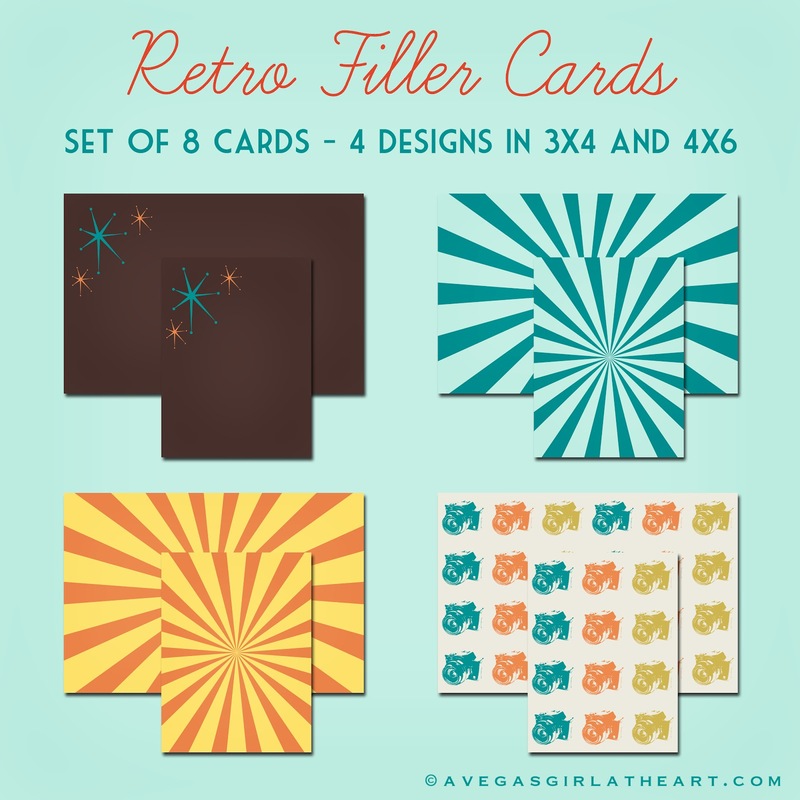 And finally, one lucky reader will win ALL 8 brand new Retro digital releases from my Etsy shop. All you need to do to enter this giveaway is leave me a comment on this post (Facebook comments do not count). Make sure there's a name/identifier somewhere in your comment so that we can tell who the winner is. Giveaway closes Monday August 20, 2012 at 11:59PM. Winner will be announced on Tuesday August 21, 2012 on my blog. Access all of my freebies here on my Pinterest board. That's it! I hope you guys like this as much as I do! Happy Friday, and I hope all of you have wonderful weekends! :) We're hopefully taking Austin up to Storyland in NH, if the weather holds out. Project Life is a product created by Becky Higgins. I am not affiliated with Becky Higgins in any way. I participate in scrapping my life using Project Life products. You can learn more about Project Life on Becky's site, here. Thanks so much! They rock! these are terrific! thanks so much for the chance! These look awesome Melissa! Thanks for the chance to win your etsy store , you are so generous. I was wondering... If at all possible could you do a version of the Favorite card with the AUS/UK spelling Favourite maybe as next weeks Friday freebie ? I really love the card...but being an Aussie we can't use it. Thank you. Elizabeth, Brisbane , QLD, Australia. Perhaps in a few weeks I can create a new set. It's not a simple fix, I'll need to adjust sizing on the text and do the background colors again, and I need to take a few weeks to catch up on everything I've put on hold to pull this together. But sometime in September I could put together a set with the alternative spelling. Thanks from another Aussie too.. you do great work! Wow! These look amazing! A very generous giveaway! I'd really like to start Project Life. These are terrific! Thank you for the chance to win these! O.my.stars! These are just lovely! I can't even begin to imagine how long and hard you worked on these? thank you sooo much! wow! thanks for this! it's great! I'm new to project life, photoshop, and computer scrapbooking, so this is soooo cool! thank you! Thank you for sharing, this kit is beautiful. How thanks for all the goodies! They are wonderful! These are going to be so much fun to play with. Thank you for sharing! Wow! Love this! This had to have taken many, many hours! I would love to win. Wow! I am constantly amazed with the quality of the free stuff you and other designers put out! I am new to Project Life and I doubt I will ever buy a whole core kit again when there is such awesome stuff online for free or low cost in a digital form! Aw, thanks for that compliment! I don't want to take away from Becky's products though, I love her stuff. I just get bored with the same thing all the time, and I like coming up with new things that can add to the current kits. I put a lot of things out free because I enjoy creating them and it makes me really happy to share! With this one, I did want something different than I'd seen out there. And you're right, there's so much here that it could be a standalone kit. I am super excited for her baby kits though! There hasn't been too much baby themed stuff out there yet so I can't wait to see what she's releasing next week. I still want to do my son's first year album with one of the kits - either the neutral or the boy kit, whichever design I like best. Thank you so much for sharing your amazing creative talent with us! This kit is so perfect and I can't wait to use it in my Project Life! Love it all! Wow, all the Retro elements are amazing. I especially love the bottle caps... and the view finder! Thanks for the freebies and thanks for the chance to win, my fingers are crossed!!! Thanks so much. I always enjoy your freebies. My name is Ina. I have followed your blog re PL all year. Retro is my very favorite. Thanks for this labor of love shared with all of us. WOW!!! THANK YOU so much! I just started Project Life and LOVE your stuff!!! Awesome! You are so generous. Thanks for the chance to win. Wow! Love it, especially the view finder and the instagram collages! Thanks for the chance to win it! Thank you so much for all the AMAZING freebies you put together. I am in awe of you and truly appreciate you sharing your talent! This was AWESOME! I JUST started PL three weeks ago after procrastinating for two years. I LOVE the product. I'm just trying to get into a grove first and then hopefully can start embellishing!!! Thanks again! You have really outdone yourself this time. These are lovely and I want them all!!! Thanks for the freebies and the chance to win! Holy smokes! I am in complete awe at your awesomeness! Your work is amazing and I am always excited to see your work. Thank you so much for sharing your talent with us! Awesome! Wow talk about great designs. I have just begun using different products with my PL and these would be so cute to use. Thanks so much for all the freebies and am definitely stocking up at your store. My gracious! You weren't kidding when you said this was BIG! LOL How wonderful! You really did a fantastic job on this entire collection! Yes, I would love to win it! Thank you so very much! I feel your satisfaction after finishing up a project. You should be proud! I may have to participate in PL after all this! Wow you are amazing. Great freebies, I will definitely use them in my PL. Thanks so much for the change to win! Love love love you. So glad I found you. You are making my PL album really pop! These are so great. 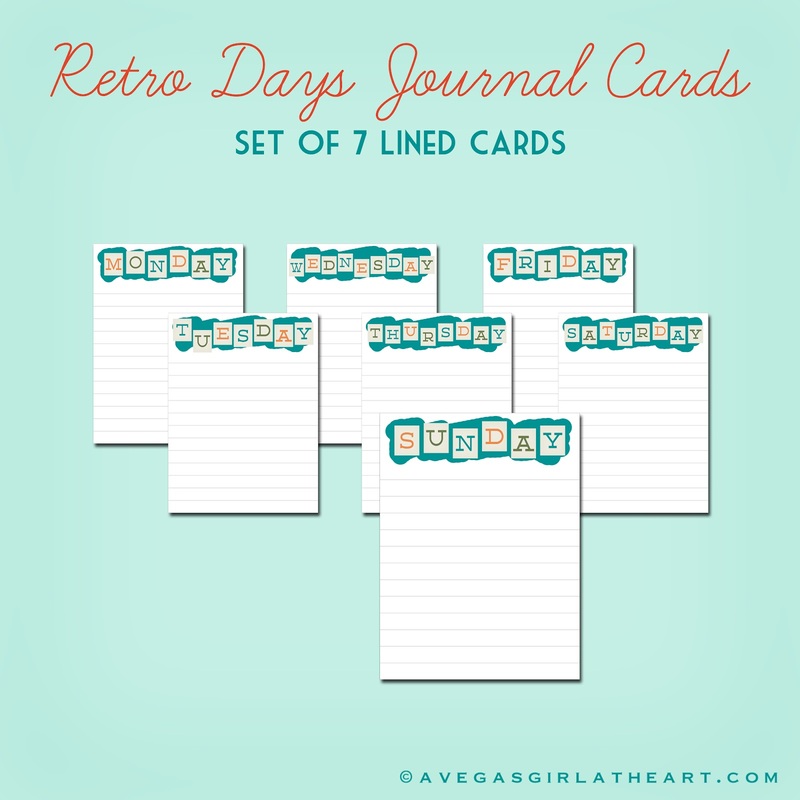 I have been using Project Life for 3 years now and I love your retro style. Thank you so much, gorgeous!!! What an awesome set. Thanks for the chance to win them. Wow these are amazing, thanks for sharing. Your generosity is astounding, thanx so much for all the Retro freebies! Will check back soon on your ETSY offerings! Have a terrific day! Thanx again! Thanks, these are so cute! great job! Hi, Melissa! Nice to 'meet' you! Thank you for your sweet comment! I meant to add the part where I was going to post about your post to my first message and it completely slipped my mind. I'm so glad you are okay with that. It is such a wonderful collection! I know some of my readers would be interested! Everyone has done a great job of thanking you but I wanted to be included in thank you too. So thank you - thank you for your amazing generosity. I also sent this to my sister who is an amazing high school teacher helping at risk kids in believing they can aspire to something better than what they currently believe. This kit or at least some of it may help them visualize success in passing their grades. Wow! That's awesome! :) Very cool. Such an awesome kit- thank you so much!!! This is stunning. Such a generous gift of time and energy and creative resources, thank you so much. And the colors and theme and execution are just fantastic. I am blown away. I can't wait to start using this. Thanks! Thanks, really generous of you, and so cool. Thank you for the awesome freebies! This retro kit is amazing, well done and thanks so much for sharing! These are wonderful!! Thank you for your generosity! THANK YOU! This is such and Awesome set!!! Lots of time put into this, thanks for sharing! Finally took the time to download and organize all those wonderful freebies. Good job on the work done and thank you so very much for sharing those freely for Project Lifers to use. Thanks so much! The snow day card is perfect for our early snow here in Germany! Thanks so much! The snow day card is perfect for our early snow day here in Germany. Thank you so much - these are great! Thanks so much for this awesome PL set - love the retro look! Wahou! merci beaucoup, c'est vraiment très beau. Bravo. I just found these and they are beautiful. Thank you for sharing! I just found these and they are beautiful! Thank you for sharing! I am new to pocket scrapbooking and just found your site! I am sooo thankful I could still download your files. They are wonderful! Thank you! This kit was especially cute!